The continuing mass uprising against Syria’s Bashar Assad dictatorship on the one hand, and the growing intervention by the reactionary Gulf monarchies of Saudi Arabia and Qatar, along with Turkey, on the side of the growing armed insurgency on the other, has led to a situation where many on the left are sharply divided over who to “support”. As an aside, it should be emphasised that these two potentially reactionary aspects – the extent to which the opposition has become a “jihadi” Sunni sectarian force, and the extent of imperialist intervention, are not one and the same thing; as will be shown below, while there is some overlap, they also somewhat operate at cross-purposes. Meanwhile, others erect virtual soap boxes from which they piously denounce anyone even raising these valid issues of the extent of the Saudi/reactionary intervention as sycophants for Assad and as “counter-revolutionaries”. While partially correct that the Saudi-led counterrevolution has probably not utterly extinguished the genuine uprising, they tend to exaggerate in the other direction, refusing to see the extent of reactionary and sectarian counterrevolutionary intervention; some go so far as to denounce opposition to imperialist intervention as … counterrevolutionary. This article does not propose a “solution” to this problem, as much of this heat appears to stem from lack of clear information over exactly what is occurring and the relative weight of genuine uprising (including elements of armed self-defence) vis a vis reactionary terror; the only thing that appears clear is that both exist. This is not an argument for neutrality. Rather, we should have no hesitation in saying the Syrian masses have the right to rise against a vicious dictatorship, and where a population is defending itself against the regime’s armed forces, including by arming themselves, our sympathies ought to be with them; yet we should also have no hesitation in sympathising with minorities under vicious attack, including sectarian ethnic cleansing, from armed reactionary elements that certainly do exist and have been increasingly carrying out such attacks. To “know” which is the more dominant element seems to be largely a matter of opinion, with relatively few attempts at in-depth analysis of this question. Richard Seymour made one such solid attempt on his Lenin’s Tomb blog: while one may not agree with it all – I thought it was excellent but did somewhat underestimate the degree of sectarian degeneration – it is such solid analyses that are worth much more than the kind of feverish declarations of “support” and denunciation of opponents as traitors that much discussion has descended into. This article will rather focus on the geopolitics of the situation. Often, some of the feverish views are accompanied by declarations that this is all an imperialist plot, as a way of showing opposing views to be beyond the pale. In reality, there is no one “imperialist” view, let alone an agreement of views between imperialism, Israel and the reactionary Arab monarchies. One view tries to emphasise an alleged Israeli role in the crisis. Sometimes this is motivated by a desire to show how reactionary Assad’s opponents must be if backed by such a reactionary regime as that of colonial-settler Israel and how this proves the imperialist hand. In other cases, it is meant to show that Israel (and perhaps the Jews) run the world, including the US government. The reason such arguments are appearing is to counter the embarrassing (for apologists for the Syrian Baath Party regime) reality of Israel’s very obvious silence for at least a year after the uprising began until very recently. For example, James Petras writes that the insurgency is an attack on Syria by the “Triple Alliance” of the US, the Gulf Cooperation Council (i.e., the Saudi, Qatari and other reactionary oil monarchies of the Gulf) and Israel. More recently, Mimi Al Laham (aka “Syrian Girl”) and Lizzie Phelan penned a piece entitled, “How leftist anti-Zionists are allied with Israel against Syria”. As the title suggests, the authors claim that Israel has been a key proponent of regime change in Damascus, and that anyone disagreeing with their analysis is therefore “allied” to Israel in this alleged quest to topple Assad. Much of the article is spurious – the authors give examples of statements by US leaders advocating the end of Assad or support to the insurgents, and say that because the US is Israel’s main ally, that is evidence of Israel’s view. At one point they even argue that the open Saudi-Qatari support for the rebels is evidence of Israel’s view, since these Arab states, like Israel, are US allies. Talk about circular reasoning; and as if Israel and Saudi Arabia/Qatar agree on everything. The Saudi and Qatari leaders don’t even agree with each other on everything. Al Laham and Phelan do give a few examples of Israeli leaders calling for support for overthrowing Assad. However, it is notable that even they admit these are very recent statements: such statements from Israeli leaders have mostly happened as Assad’s situation has become more untenable whatever anyone may do to help him. But even then, as we will see below, there are just as many, if not more, examples even from the recent period which reveal great Israeli trepidation over Assad’s likely fall. Syria is a member of the Axis of Resistance, which is the only effective military resistance to Israel left. It is made up of Syria, Iran and the resistance inside Lebanon with Hizbullah at the helm… Israeli Intelligence Minister, Dan Meridor, was quoted on Israeli radio pointing out what was obvious all along: Regime change in Syria would break the Iran-Syria mutual defence pact thereby isolating Iran and cutting the supply of arms to Hezbollah … those cheerleaders who maintain that Assad is good for Israel have been unable to reconcile then why Israel relentlessly beats the war drums against one of Syria’s most important allies, Iran. While this is the most serious argument, the reality is far more complex and contradictory. But before going into specifics, it is first necessary to deal with some of the simplistic thinking exemplified in this article. It is first important to avoid the idea that there is "an imperialist position”, "a US position" or "an Israeli position”, let alone a “position” necessarily held by the US and all its allies together. “Imperialism” does not think and thus “have a position”; there are lots of different spokespeople and ideologues, who often have markedly different views on what is best for their class. One very good article about Israeli views on Syria is, “The Israeli Position toward the Events in Syria”, because it looks at varying views among different sections of the Zionist ruling class and weighs them up, rather than assuming there is “an Israeli view”. This article covered the view above – regarding Syria as the link between Iran and Hezbollah – but also other concerns, particularly that the Assad dynasty has maintained its border with the Israel-occupied Golan Heights meticulously quiet for 40 years, which may not be the case if it is overthrown – and came to the conclusion that, overall, for the Zionist rulers, the dangers of the overthrow of Assad outweigh the possible benefits, despite differing views. Meanwhile, Israel’s intelligence chief, Major General Aviv Kochavi, “warned that "radical Islam" was gaining ground in Syria, saying the country was undergoing a process of "Iraqisation”, with militant and tribal factions controlling different sectors of the country”, and claiming there was “an ongoing flow of Al-Qaeda and global jihad activists into Syria”. Making clear that his fears were about Assad losing, he said that with the Assad regime weakening, “the Golan Heights could become an arena of activity against Israel, similar to the situation in Sinai, as a result of growing jihad movement in Syria” (http://www.dailystar.com.lb/News/Middle-East/2012/Jul-17/180917-assad-moving-troops-from-golan-to-damascus-israel.ashx#axzz20t8QAeyJ). In a similar vein, Yoav Zitun, writing for Israeli newsagency Ynet, reported that, “The IDF is preparing for the possibility that global Jihad terrorists will launch attacks from Syria in case President Bashar Assad's regime will fall … Army officials are not ruling a situation whereby terrorists will take advantage of the chaos that may follow a regime change in Damascus to seize control of the border region, as was the case in the Sinai Peninsula after Egyptian President Hosni Mubarak was overthrown.” The army was “gearing for a number of possible scenarios, including a cross-border attack by global jihad, which is operating in Syria against Assad's regime”. Brigadier-General Tamir Haiman warned of possible attacks “launched without prior warning from army intelligence – as was the case in the attack in Ein Netafim a year ago, which originated in Sinai". The analogy being made in both excerpts above to the fall of Mubarak and the resulting “instability” on the Egyptian border highlights precisely one of Israel’s key geopolitical concerns about the Arab Spring. According to Khaled Amayreh in Al-Ahram, Israel was “dismayed” by the election victory of Muslim Brotherhood chief Mursi in Egypt. He claimed a major “pillar” of Israeli policy “was courting and neutralising Arab dictators who proved highly effective in pacifying their own masses” but now Israel “is beginning to lose” this pillar. He quotes Ron Ben-Yishai, editor-in-chief of the Israeli website Ynet, not only warning of the “danger posed by the ascendancy of the Muslim Brotherhood to the helm of power in the most important and populous Arab country”, but also that “Egypt's Islamicisation constitutes a very negative harbinger for secular regimes that rely on the army, not only in Lebanon and Syria, but also in Jordan and the Palestinian Authority”. Thus, while the idea that Israel may desire the fall of Assad derives from the idea that it aims to break the strategic connection between Iran, Iranian-influenced Iraq, Syria and Hezbollah in Lebanon (the so-called “Shia crescent”) – above all Syria’s role as the link between Iran and Hezbollah – Israel is in fact more concerned about a new rising “crescent” of Sunni regimes strongly influenced by the Sunni Islamist Muslim Brotherhood – the new Egypt, Hamas in Gaza, Turkey led by the soft-Islamist AKP, which has come into serious conflict with Israel under this regime, and now the possibility of forces linked to, or led by, the Muslim Brotherhood taking power in Syria. And since Assad has kept the Golan border meticulously quiet for 40 years – just as did Hosni Mubarak in Egypt – Israel fears this turn of events would lead to similar disquiet on the Syrian Golan border as has occurred on the Egyptian Sinai border. While it might seem odd that both combinations of states and movements are regarded as a threat by Israel, it is not really: being a colonial-settler state and imperialist outpost in a region dominated by the nation you have ethnically cleansed en masse does tend to lead to everyone in the region – Sunni and Shia Muslims, and Christans, Druze, atheists etc. – hating you. But the idea of the new “Sunni crescent” completely surrounding Israel, and including an actual Palestinian component (Hamas), is actually more threatening than the less-connected “Shia crescent”, even if the latter includes Hezbollah. It is thus no surprise that nearly every statement in recent days from Israeli leaders threatening to intervene in Syria under the guise of the risk of chemical weapons has been worded to the effect that such intervention would be reacting to the threat posed by the fall of the Assad regime, which might allegedly lead to “terrorists” – whether Hezbollah or anti-Assad Sunni “jihadis” – getting these weapons. As Israel’s defence minister Ehud Barak stated, “The moment Assad starts to fall we will conduct intelligence monitoring and will liaise with other agencies” regarding such intervention. More generally, the idea that the Assad regime has been one of the “resistance” forces to Zionism and imperialism is so far from reality that one wonders why it is often believed. Israel has annexed Syrian territory – thus any Syrian regime, whether Assad or a regime which overthrows him – will never “make peace” without getting Syrian land back. Syrian backing of Hezbollah in Lebanon is the regime’s way of putting indirect pressure on Israel without confronting Israel itself; yet in the past, the regime has not been averse to slaughtering Hezbollah militants. Yet while no shot has been fired on the Golan since 1973, the Assad dynasty has more Palestinian blood on its hands than any other Arab state except Jordan, with events in 1976, 1985 and 1985-6 standing out (see full analysis at http://links.org.au/node/2766), as the regime tried to show Israel how good a Camp David style partner it was willing to be if only it handed back the Golan; Israel, however, with a regime like that next door, figured it could have its cake and eat it too. Some claim, contrawise, that the secret "Israeli position" has always been the "Lebanonisation" – fragmentation – of all Arab states, to weaken them, and allow Israel to run roughshod over them. As above, this has historically been “one” Israeli view rather than “the” Israeli view. It may have been correct about Israel's view of Iraq, given that country's size; and thus with the US destruction of Iraq, Israel began viewing Iran as its main enemy. But with Iraq already in pieces, there is little need for it in smaller Syria, especially given the dangers involved and Assad’s pliant behaviour. Moreover, there is a serious problem in this argument, however good it sounds. The argument is that Israel would prefer Syria to be the same mess as Lebanon. Yet Syria's main crime in the recent past, from Israel's point of view, has been its semi-backing of Hezbollah (more on this below), the only Arab force to deliver a defeat to Israel. Hezbollah, however, is in "Lebanonised" Lebanon, not in Syria. So since there is not even one single Israeli view, there can hardly be a US-Israeli view; and even though the dominant Israeli view has been largely pro-Assad, this does not at all mean this is the US view (aside from the differences within US ruling elite itself), because Israel is not a puppet of the US, and still less is the US a puppet of Israel, as more fanciful views claim. And for the same reasons, it is also very wrong to claim that the hard line pushed by Saudi Arabia, Qatar and the Gulf sheikdoms, or Turkey, is the same as the US view, or is due to them being puppets of imperialism. On the contrary, the Saudis and Qataris are pushing their own very ambitious regional realignment, using parts of the Muslim Brotherhood as a proxy, for their own reasons, while the AKP regime in Turkey is doing much the same for similar reasons, as well as other specific reasons related to Kurdistan. Israel is extremely uncomfortable about this (as some of the views expressed in that article showed). US President Barack Obama’s regime in the US stands somewhere uncomfortably in between. What then are the key interests of Saudi Arabia, Qatar and Turkey in this? On the one hand, while Saudi Arabia and Qatar have been the most active in pushing for Assad’s ouster via arming the opposition, it ought to be understood that the potential in 2011 for a popular uprising to oust the Assad dictatorship was a mortal threat to these tyrannical monarchies. If people can overthrow dictatorships in Egypt, Tunisia and then also Syria, and neighbouring Yemen and Bahrain can be openly threatened, then why not Saudi Arabia and Qatar? In fact, there has been a popular upsurge in eastern parts of Saudi Arabia, which has been brutally crushed, as was the uprising in Bahrain. On the other hand, despite their horror at the prospect of popular revolution, these states are also engaged in regional rivalry with Iran, and a key ideological prop of this rivalry is the division between Sunni and Shia Islam. Saudi Arabia projects its power via support for various extremist Sunni fundamentalist groups (“Salafis”), while Qatar is headquarters of the somewhat more moderate Sunni fundamentalist Muslim Brotherhood. While the whole Arab Spring was a mortal threat to these tyrannies, they used their grotesque wealth to fund such Islamist currents within these movements in Egypt, Libya and Tunisia in order to try to take control of them. Meanwhile, Iran funds Shiite fundamentalist forces, in Iraq and in Lebanon. With the majority Shia in Iraq emerging much more powerful since the ouster of Saddam Hussein, and with Hezbollah emerging powerful in Lebanon due to its role in defeating Israel’s occupation there, the Saudi-led states see Iran’s position becoming more powerful. Where does Syria come into this? In fact, Syria had a long-term good relationship to the Saudis and Gulf states, but maintained a strategic alliance with Iran. While very secular, the Assad regime is heavily based among the minority Alawite sect, a branch of Shia Islam, and as such is widely detested by the Sunni majority there who feel disenfranchised by this unofficial reality. In the 1980s, Assad senior brutally crushed a popular uprising that was largely led by the Muslim Brotherhood, and so the regime saw Iran as a more reliable long-term ally against its sectarian rivals. While Syria’s Western-backed invasion of Lebanon in 1976 was initially in support of the right-wing Christian forces and involved crushing the Palestinian-Muslim-leftist alliance, over time Syria’s role settled into being the key supporter of the disenfranchised Shiite element of the population. And with Israel refusing to hand back Syria’s Golan Heights, which it stole in 1967 and even annexed – an act of pure international piracy – in 1981, Assad allowed his country to be the link between Iran and Hezbollah in Lebanon, allowing Hezbollah to put pressure on Israel while Assad kept the Syrian border on the Golan utterly quiet. As such, the Saudi-Qatar need to derail the Syrian revolution coalesced with the regional rivalry with Iran to form a policy of promoting the Sunni fundamentalist forces active within the Syrian opposition in a bid to not only try to take control of the uprising – as elsewhere – but also to foment Sunni-Alawite sectarian conflict, to turn popular revolution into sectarian bloodletting, killing two birds with the one stone. Given the fact that there is a large Shia minority in Saudi Arabia in the eastern oilfields region, where rebellion is centred, and that the Shia majority led the uprising in Bahrain against the minority Sunni sectarian monarchy, this fomenting of sectarianism regionally also allows these monarchies to demonise the uprisings in their countries as nothing but “Iranian subversion”. There seems little doubt that the Saudi-Qatar aim is the destruction of Assad’s regime and the conquest of power by a Muslim Brotherhood-led regime, effecting a victory in the regional rivalry with Iran and a sectarian victory over their own Shia minorities/majorities. It would be a serious mistake to believe that just because Saudi Arabia is a reactionary pro-imperialist state that Israel would be fine with forces backed by this state surrounding Israel. On the contrary, these Sunni Islamist forces are a double-edged sword, and are largely just as hostile to Israel as are Shia Islamists like Hezbollah – Hamas is an obvious example – and a lot more so than Assad’s purely conjunctural position: Assad has to be officially “anti-Israel” since Israel occupies Syrian land, but no regime coming to power in Syria will be willing to give up the Golan to Israel. In the case of Turkey, the AKP regime has also laid claim to regional leadership, and over the last few years has even projected a “neo-Ottomanism”, meaning Turkish leadership within the regions once ruled by the Ottoman empire. However, although the AKP, as a “soft” Sunni Islamist party, can be seen as related to the Muslim Brotherhood, the AKP’s neo-Ottoman strategy did not involve promoting sectarianism. On the contrary, it involved good relations with Iran and Syria as well as with the Sunni-led states as part of Prime Minister Erdogan’s quest for “statesman-like” leadership in resolving regional disputes within the Muslim world. At the same time, this “eastern turn” involved increasingly distancing Turkey from its long-term alliance with Israel, which had been cornerstone of policy when the anti-Islamist generals ruled Turkey. Turkey has clashed with Israel in cases such as the Mavi Marmara, and built links with anti-Israel Islamist groups like Hamas and Hezbollah. At the outset of the Syrian and Libyan uprisings, Turkey reacted cautiously, initially opposing Western intervention in Libya, but as Erdogan saw the writing on the wall, suddenly jumped in to use the AKP’s Islamist credentials to support the same forces Qatar was supporting. In the case of Syria, however, this has a more specific significance. Syria, like Turkey, Iraq and Iran, is home to a large Kurdish minority. Part of Erdogan’s growing alliance with Syria and Iran had been anti-Kurdish solidarity. Assad abandoned his earlier opportunistic support for the Kurdish Workers Party (PKK) in Turkey and policed Turkey’s border. However, the Syrian uprising threatened to pull all this apart, especially if Syria’s Kurds took part. Turkey has therefore actively intervened to try to ensure – through its “Islamist” connections and more generally hosting opposition Syrian National Council (SNC) leaders – that whoever eventually takes power will be in debt to Turkey and thus maintain an anti-Kurdish position. In addition, the Israel-Turkey conflict has recently taken on a new dimension, with the discovery of natural gas fields in the east Mediterranean Sea. In a minor diplomatic revolution, Greece and Cyprus have developed a new strategic alliance with Israel to co-develop these fields and thus limit Turkey’s role there. Turkey for its part is trying to stop Cyprus exploiting these fields around the northern part of Cyprus still under long-term Turkish occupation. Israel’s energy minister Uzi Landau recently vowed, "Israel can support and secure the rigs that we are going to have in the Mediterranean”, after Turkey declared its plan to boost naval patrols in the eastern Mediterranean in a deepening diplomatic feud. Meanwhile, Lebanon has accused Israel of breaking international law by exploring for gas without an agreement on the maritime border between the two countries (http://www.haaretz.com/news/diplomacy-defence/israel-vows-to-defend-gas-after-turkey-threatens-to-boost-navy-patrols-in-mediterranean-1.383820). It is thus fairly obvious that Israel also has no interest in Turkey extending its influence into Syria. What then of the fact that Assad’s Syria is Iran’s ally and that Israel has for months now been hell-bent on a ferocious display of aggression towards Iran, ever-threatening to attack the country to hit Iran’s civilian nuclear facilities? Why wouldn’t that make Israel the most anti-Assad of regional pro-US states? How does that fit with the obvious reality that it has been the least? It is actually very interesting that of all these players, it is the state that has had the most pro-Assad position that is precisely the state that is most aggressively hell-bent on taking out Iran; and that contrawise, those most aggressive against Assad -- Saudi Arabia, Qatar and Turkey -- are also vociferously opposed to an Israeli attack on Iran and terrified of its consequences. For example, in March, Qatar’s foreign minister Hamad Al Thani declared, “We will not accept any aggressive action against Iran from Qatar”, despite the presence of a US base on its soil (http://www.jpost.com/Headlines/Article.aspx?id=263818). On August 10, the Israel newspaper Yedioth Ahronoth reported that Saudi Arabia had threatened to shoot down any Israeli aircraft over its airspace en route to or from Iran (http://www.informationclearinghouse.info/article32129.htm). On March 29, Erdogan, on a state visit to Iran, declared, “Turkey has always clearly supported the nuclear positions of Iran, and will continue to firmly follow the same policy in the future”, stressing that “no one should be allowed to harm the friendly ties between Iran and Turkey” (http://www.payvand.com/news/12/mar/1271.html). It is clear that the Gulf monarchies see an Israeli attack on Iran as enormously destabilising, risking to swing their Sunni Muslim populations strongly behind Iran and against any regime seen as collaborating with the US or Israel in such a venture, undercutting their drive to forge a sectarian divide in the region. In this connection, Alistair Crooke penned a very interesting article that argues precisely that for many, regime change in Syria to break the “nexus” between Iran and Hezbollah is precisely being pushed as an alternative to a catastrophic Israeli attack on Iran. He quotes former Mossad head Efraim Halevy, who holds this minority view in Israel, that “ending Iran's presence in [in Syria] poses less of a risk to international commerce and security than harsher sanctions, or war [on Iran would pose]”, and continues in reference to the aggressive campaign by Benjamin Netanyahu and his supporters in the US Republican Party for war on Iran that: "It is against this background that 'regime change' in Syria becomes so important. Both in Israel and America, there are serious constituencies which argue that a direct military strike on Iran would provoke a terrible disaster. To answer this, the combination of financial siege on the Iranian people, in combination with the overthrow of Assad -- in favor of an anti-Iranian, Sunni successor -- is crafted precisely to assuage those hawks demanding military action." This argument closely fits the Saudi-Qatari-Turkish view -- for them breaking Iran's regional power and its connection to Hezbollah through Syria by overthrowing Assad is much better than an Israeli attack on Iran, while also giving them their proxies in power -- an alternative Israel is not happy at all with. Israel, by contrast, prefers to solve the same “problem” via an attack on Iran while leaving a known dictatorship in power in Syria. US imperialism dominates the Middle East partially via two key regional props, two “abnormal” formations that don’t exist elsewhere in the world: the Israeli Zionist settler state and the oil monarchies of the Gulf. In this particular conflict they appear to have opposing views and interests. Where then does the US stand? Verbally at least, the US has appeared to stand closer to the Saudi alliance, especially with some of the aggressive – and sensationally and sickeningly hypocritical – rhetoric coming from Hillary Clinton and other leaders. There has also been a very recent shift to more active support to the anti-Assad forces. For example, the July 20, 2012, New York Times claimed President Obama is “increasing aid to the rebels and redoubling efforts to rally a coalition of like-minded countries to forcibly bring down the [Syrian] government”. It reported that CIA operatives have been based in southern Turkey “for several weeks” while the US and Turkey are working on putting together a post-Assad “provisional government” in Syria. The US reportedly issued a “secret order” authorising “non-lethal” covert support to the Free Syrain Army (FSA), i.e. training, logistics, communications assistance. Not to be outdone, British former SAS soldiers are reportedly training Syrian rebels at a base inside the Iraqi border. In comparison to the Saudi and Gulf tyrants, however, the US has been markedly slow to swing clearly this way, and even now that it has, it still emphasises that it will not arm the FSA, while now officially supporting the Gulf arms channel. Even more clearly, in the very same period that the US has been moving more clearly to authorise some degree of support for the FSA, the US media and various leaders have also began expressing alarm over the rise of “Islamist” forces within the armed opposition, whether Saudi-backed “Salafist” groups or al Qaeda. For example, the NYT article, “As Syrian war drags on jihadists take bigger role” , reported that “a central reason cited by the Obama administration for limiting support to the resistance to things like communications equipment is that it did not want arms flowing to Islamic radicals. More ominously for the US, articles such as “Al Qaida turns tide for rebels in battle for eastern Syria” report on “fighters who have left the Free Syrian Army for the discipline and ideology of global jihad”. This is all the more reason why the US has been attempting to influence certain forces within the opposition: “The C.I.A. effort is aimed in part to help keep weapons out of the hands of fighters allied with Al Qaeda or other terrorist groups, one senior American official said. By helping to vet rebel groups, American intelligence operatives in Turkey also hope to learn more about a growing, changing opposition network inside of Syria and to establish new ties to fighters who may be the country’s leaders one day” (http://www.informationclearinghouse.info/article31958.htm). But it is precisely in this way that the US interest somewhat diverges from the Saudi interest. This is not only in the sense that the Saudis back the most sectarian forces as part of their regional game, whereas US leaders have been emphasising the need for a post-Assad regime to be inclusive of Alawites, Christians an other minorities. More importantly, while the Saudi-led offensive aims to destroy the regime, the US has made abundantly clear that it aims for a “Yemen solution”, that is, one where Assad goes but his regime is preserved, with some of the opposition – screened by the US – joining in. For example, as David Ignatius reports in the Washington Post,Obama “is seeking a ‘managed transition’ in Syria with the twin goals of removing President Bashar al-Assad as soon as possible and doing so without the evaporation of the authority of the Syrian state”. On July 30, US defence secretary Leon Panetta stressed the importance of “preserving stability” when Assad leaves: “The best way to preserve that kind of stability is to maintain as much of the military and police as you can, along with security forces, and hope that they will transition to a democratic form of government” (www.reuters.com/.../us-syria-crisis-usa-idUSBRE86T1KP20120730). This need for “stability” reflects imperialist concern to maintain control vis a vis either a (increasingly unlikely) genuine popular quest for power, or a seizure of power by Islamist forces. “If the Assad regime did fall, this would provide more Islamist militants with a potential opportunity to establish a new foothold in the heart of the Middle East”, according to Charles Lister from Jane’s Terrorism and Insurgency Center. “The temporary lack of state structures would also afford aspirant militant Islamists with a safe area for training” (http://www.informationclearinghouse.info/article31958.htm). Expressing concern over “extremists” getting their hands on Assad’s chemical weapons, Panetta noted that “particularly when it comes to things like the chemical sites, they (the Assad regime) do a pretty good job of securing those sites”. John Bolton, US neo-con and fanatical supporter of Israel's Likud Party – who has been calling for a US-Israeli attack on Iran for years – summed up these fears even more clearly, writing that, “There will undoubtedly be an imminent risk of humanitarian disaster if Assad falls, including a bloodbath against his supporters or massive flows of refugees and displaced persons”, but to prevent even greater disaster “we must not permit terrorists like Al Qaeda or Hezbollah in next-door Lebanon, rogue states or a radical Syrian successor regime to acquire these capabilities” (http://www.foxnews.com/opinion/2012/07/24/america-and-its-allies-must-prepare-to-secure-syria-weapons-mass-destruction). As such, while US rhetoric often sounds closer to the view of the Saudi axis on this issue, actual US policy contains many of the same fears as those of Israel, and in many ways straddling the fence almost exactly. Interestingly, while Turkey’s forthright role in backing Syria’s armed opposition and promotion of Islamists places it in alliance with the Saudi/Gulf axis, Turkey itself also shares US and Israeli concerns over total collapse of the regime, precisely because any disintegration of the Syrian state opens the way for an autonomous or independent Kurdish entity in the north, which could join Iraq’s autonomous Kurdish entity and threaten to involve the millions of Kurds in Turkey and Iran. Indeed, this is already happening. Until the uprising began, Ankara and Damascus were strongly allied in crushing their respective Kurdish populations. But with Turkey supporting the FSA, Assad decided on a maneuvre by releasing jailed Kurdish Workers Party (PKK – the Kurdish group fighting Turkey with a presence in northern Syria) from prisons, to cause annoyance to Turkey and to strengthen the PKK against the Kurdish forces there loyal to corrupt Iraqi Kurdish leader Massoud Barzani, who, due to geopolitical reasons, was currently allied to Turkey and in opposition to the Shia regime in Iraq, currently allied to Syria. In late July, this went further than Assad had bargained for, with the local Democratic Union Party (PYD), a Kurdish independence group allied to the PKK, taking control of a number of northern Syrian provinces with Kurdish majorities. To complicate things further, when Turkey then tried to use Barzani to intervene with his PDK (Kurdish Democratic Party) forces against the PYD-PKK, Barzani did something he has almost never done before – he joined forces with his fellow Kurds against all local regimes! Indeed, in the background, the Hawler Agreement had been signed on July 9-10, 2012, uniting all Syrian Kurdish groups in a Supreme Kurdish Council (ENSK). Turkey’s collaboration with Syrian Islamists and the SNC aims to ensure that, as successors to Assad, they maintain Assad’s opposition to Kurdish autonomy (and this has been successful judging by the position of the SNC). However, whether total control can be gained by the SNC and Islamist forces is in doubt, and while an extended inter-sectarian blood-letting may suit the Saudi Arabian project as long as “its guys” have the upper hand, fragmentation of the Syrian state would clearly not suit Turkey. Often when geopolitics is discussed, it is immediately assumed that a modern version of the US-Russia Cold War rivalry is the main issue. While rivalry does exist, it appears to not be the central issue in Syria, though the crisis itself exacerbates tensions. The fact that Russia maintains a naval base in Syria and the regime has been a long-term ally is undoubtedly a factor in Russia’s strong support for the regime. It is much less certain, however, that the US aim is to remove Assad in a geopolitical struggle against Moscow. On the contrary, the US knows that Assad senior sent troops in the first US war against Iraq in 1991, and was engaged in torture “renditions” of “Islamist” suspects on behalf of the US “war on terror”. As such, Assad was seen as useful, if not loved, by both Moscow and Washington, and even after the uprising broke out, the US for quite some time kept a low profile and emphasised “reform” rather than regime change. In fact, to the degree that the US favours a maintenance of the regime with a cosmetic change at the top, this is not so distant from Russia’s view. As noted above, Turkish leader Erdogan tried to get such an agreement from Moscow, and Obama lent support. The main snag is that so far Russia refuses to budge even on Assad himself. Countless statements from Moscow seem to indicate, however, that Russia is not bonded to Assad, and indeed it has at times strongly criticised the regime’s excessive violence. However, in as much as US leaders are using the crisis to up war-like rhetoric – however divorced from their actual view – this pushes Russia into a corner and thus it refuses to make such a concession under apparent duress. Israel Shamir is the name of a Jewish anti-Semite, almost neo-Nazi, who writes prolifically on the Middle East. Recently, he claimed to have a leaked report from a Netanyahu-Lieberman-Putin meeting during Vladimir Putin’s recent visit to Israel. Shamir asserts in the article that Israel’s goal is the complete “Somalisation” of Syria and that it is very much behind the Islamist opposition to Assad. While normally, the writings of such a reactionary ought to be ignored, the interesting thing here is that if his evidence of the leaked report has any truth, it in fact shows the complete opposite of what he asserts. Shamir claims Netanyahu asked Putin to facilitate Assad’s departure, and to “appoint his successor, and we shall not object”. The only alleged condition put by Netanyahu was that “the successor must break with Iran”. Putin replied that he didn’t have a “successor” to appoint. The point, however, is that if such a leaked document exists, it once again shows that Israel, like the US, aims to maintain the regime intact, and that it has no problem even with Syria remaining in the Russian sphere, as long as it breaks with Iran. It is clear that there are any number of aims and strategies being pushed by various imperialist powers and regional “sub-imperialisms”, in many cases completely contradictory with one another. 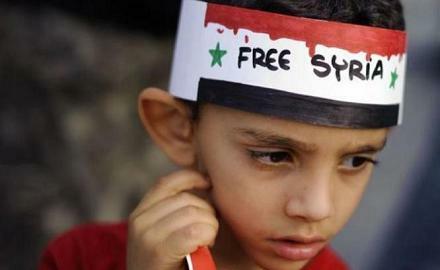 The left’s sympathies ought to remain with the Syrian people confronting a vicious regime. However, given that the Saudi-Gulf counterrevolution is also active in trying to hijack the revolution, and that this includes a rising tide of viciousness often directed against non-Sunni communities – and that a significant part of these communities is sticking to Assad precisely because of this increasing sectarian threat – there seems little one can do from the outside to give concrete “support” to whoever is under attack at any time, or even really figure out exactly the relationship of forces between revolution and concurrent counterrevolution. As such, the only thing that must be done is to maintain and step up total opposition to any deeper imperialist intervention for allegedly “humanitarian” purposes, which would in fact be catastrophic, while not giving an inch to the view that one must become a cheer squad for the murderous Assad regime.